Lana Del Rey on the cover of Billboard, December 2017. 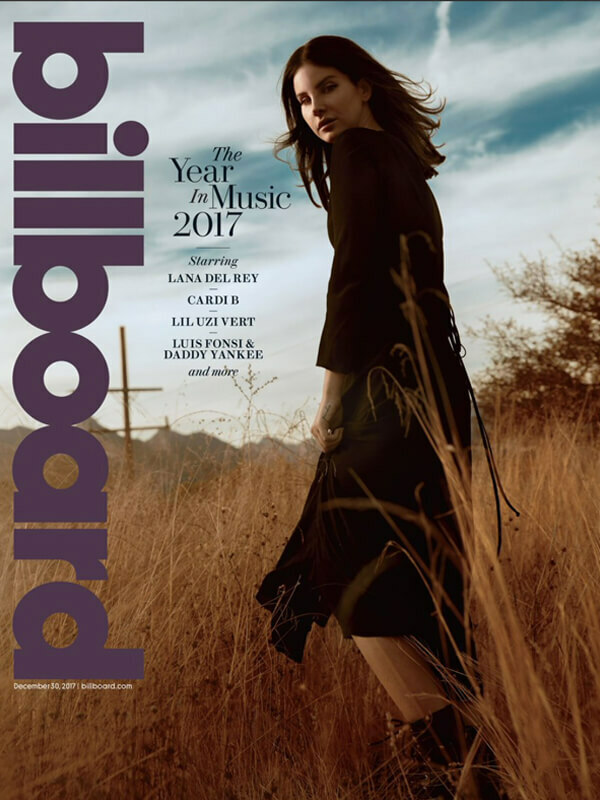 Lana Del Rey covers Billboard magazine's annual Year In Music issue, taking out one of four covers, alongside the likes of Cardi B, Luis Fonsi, Daddy Yankee and Lil Uzi Vert. On her latest album: "Honeymoon was like a vanity project, just for me. With this one, I was thinking about things broader than just my relationships, which was nice for me, and probably nice for my fans, too — a bit of a reprieve. John [Janick] and the guys I work with loved 'Love' and 'Lust for Life,' so those were really the only two singles we thought about. I'm saying 'singles' with air quotes -- for us, that just means the song's going to get a video."